You might have seen your favorite celebrity using a hoverboard on their social media pages. Or, you might have seen some hip people in your neighborhood who are rolling around through these wheeled contraptions. Now, you want to experience the action, too. But you do not know where to start. Here is a guide that will help you in getting to know more about hoverboards for sale and which brands you might like to start with. Let us begin with the basics. What exactly is a hoverboard? A hoverboard is an electrically-powered self-balancing scooter. It is a unique device used for personal mobility. It might be easily comparable to a Segway (if you know it). Though, technologically speaking, it does not directly descent from a Segway. Both are just related in technological sense. But they are not of the same type. Nobody knows where the name came from, since the product technically do not ‘hover’. There’s an existing hoverboard but it is still in prototype form. With the craze, does a hoverboard provide benefits to a person? Besides being a medium of transportation for some people, hoverboards also have minor health benefits. One is it enhances one’s concentration and eyesight. Hoverboards could run at 10Mph. To ensure safety, one must need to pay attention while riding it. This practice strengthens a person’s eyesight and concentration on the road. Second is it is considered a full-body exercise. A person needs to be upright while using it. Thus, it prevents forming humpback. 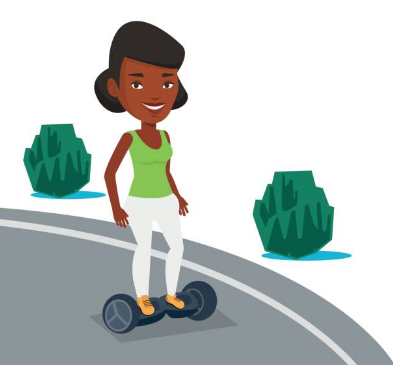 The parts of the body that are fully exercised with the hoverboard are the following: wrist, shoulder, limbs, legs, ridge, and feet. Besides that, it is said that a hoverboard can be a good tool in burning calories. 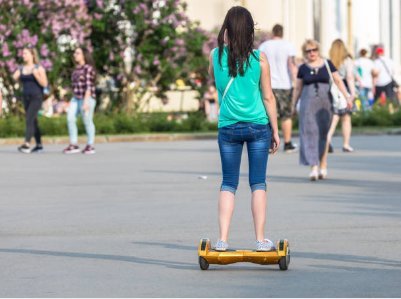 The amount differs per hoverboard unit, but the average calories burned while riding it is 285 calories per 30 minutes. Lastly, a hoverboard can also increase reflex and balancing ability. Run by aerospace attitude control theory, fuzzy software algorithm, and gyroscope system, it is said to help in one’s balance and reflex skills. Produced by Razor, a trusted and well-known company, the Razor Hovertrax is said to be one of the leading hoverboards in the market. Chinese-made hoverboards have issues with battery safety but Razor claims their product is of high quality and durable. The Razor Hovertrax 2.0 is UL 2272 certified. This means the unit passed strict safety standards. Its range is of 12 miles. This translates into 60 minutes of continuous riding. If you want to enjoy longer periods of time in riding a hoverboard, then you might like to try this one. Besides the above mentioned, the Hovertrax has a new technology called EverBalance. It is used to make the ride in this hoverboard smooth. It also claims to be easier to balance on. To climb small hills, it also asserts to offer a 15-degree tilt. Nevertheless, its downside is its top speed of 8Mph. Some might consider this a liability though some also say they enjoy a cruising speed with it. However, this hoverboard does not do well in off-road environments. 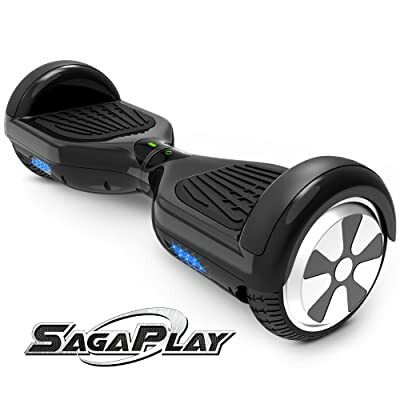 As far as safety regulations go, this SagaPlay F1 Self-Balancing Hoverboard is said to pass 159 tests on safety policies and fire hazards. Besides that, it has 250W Dual Motors. This feature helps it to climb 15-degree steep slopes. It is also over the 9-mile range, and is said to last over hour in a single charge. The non-slip food pedals and rubber tires could be attractive options for people who would like to ride their hoverboards in all terrains. This claims to carry up to 220 lbs of weight and can maneuver through grass, sand, and mud. 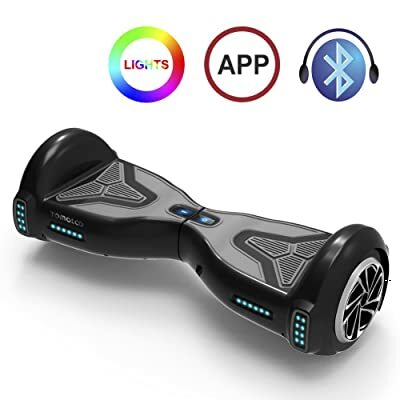 Both with UL2272 certification on the actual board and UL2271 certification for smart battery, the EPIKGO Self Balancing Hoverboard claims to be a safe and powerful hoverboard to try. It has dual 400 Watts motors, which is a fully-powered option to cruise for more than an hour, even with the speed of 10mph. With an 18-degree steep, it is said to climb slopes as its competitors above. Unlike other hoverboards in the market today, the EPIKGO hoverboard has its motors placed on the wheels rather than in the board. This is said to provide more stability with the board. This hoverboard also claims to easily maneuver on different terrains. It also has IP65 certification, which means one can ride on it through water without worries. 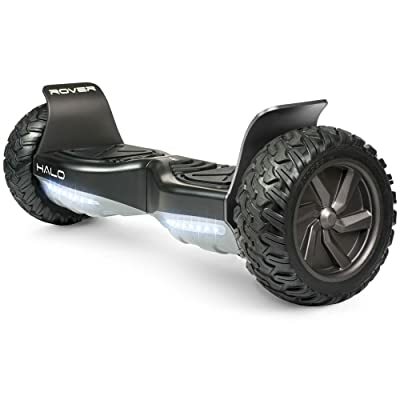 If you are looking for the perfect street cruising companion, then the Official Halo Rover Hoverboard could be the perfect fit for you. Most hoverboards have the standard 7-inch tires. But this one boasts its 8.5-inch ones. Same as the two former hoverboards mentioned above, this one can also plow through several terrains. It also claims to be rated IPX4 water resistant. This hoverboard has different modes to choose from: Beginner, Normal, and Advanced. It also has an app to switch among battery life, rider mode, distance traveled, and track speed. If you like to listen music while riding a hoverboard, this one has a bluetooth speaker, in which you can stream your jam. The downside of the Halo Rover hoverboard would be the weight. It is about six to ten pounds hevaier than normal hoverbaords in the market today. Besides the omnidirectional and adjustable LED headlights, the TOMOLOO Hoverboard claims to offer more features. It is UL2271 certified, similar with the hoverboards shown above. Though this one boats of its own app. The Tomoloo app is said to connect with your smartphone. One could adjust factors such as steering sensitivity, speed limit, battery level, and riding mode. It also has bluetooth speakers for streaming music. If you like fun while riding your hoverboard, this self-balancing scooter might be for you. Now that you’ve seen five possible hoverboards to choose from, let’s dig deeper on how to shop for a hoverboard. First and most important factor to consider is safety. Battery systems are the main safety hazard to be aware of. Several modern electronic items use a battery technology called lithium-polymer or “lipo”. They are said to be the overall best battery one should use in consumer products such as laptops and other rechargeable gadgets. Though the downside is: they are unstable. You might have heard about batteries exploding with some Samsung or LG products. And this battery is the culprit. So what can a consumer do about it? Make sure that the hoverboard that you’ll be getting has proper safety certification. You have to look for UL certification as well as protection systems that prevent overheating, short-circuiting, and overcharging. Next factor to keep in mind is the weight capacity. This is determined by how strong the frame of the hoverboard is. Some are rated to carry up to 220 pounds. This might be a little low for some adults. Some expensive ones can handle up to 300 or even 400 pounds. But yes, a customer should be prepare for the price range. A usual hoverboard could be rated for over six miles per hour. Some might reach up to ten miles per hour, though. If you’re shopping for a child, the one with six miles per hour option is considerably good already. It still feels pretty fast if you are whizzing at said speed a few inches off the ground. Ten miles is the typical range. Though one must consider the weight and speed too. The less range you’ll get out of it if you weigh more and you speed up. If you also plan to use this for transportation, make sure that the chosen range will get you to your destination. The hoverboard takes one or two hours to re-charge. Some might even take four hours. Hoverboards are known for picking up scratches and scrapes. Their wheels are just over six inches, which means it just puts you pretty near the ground. They are also advisable only to be ridden on smooth terrains. Getting one with ten-inch wheels would cause problems. One should consider on where you would travel before planning out on the size of wheels to get. Those ten-inch ones could also mitigate issues indoors, due to low doors and lights. Additionally, one should also consider the type of wheels to get. You can choose between solid or pneumatic wheels. Solid ones can’t go flat. Though they do not do well on rough surfaces and they have less shock absorption. They do not conform on the surface they are on, so grip is also compromised. Last but not the least thing to consider when shopping for hoverboards is having a warehouse or local office near you. This should not be taken for granted since after-sales service is very vital with hoverboards. A customer should ensure that he/she can purchase parts, arrange returns, and get support for the item. Now that you’ve known the guidelines in hoverboard shopping, let’s tackle the instruction on how to ride one. First thing to ensure is have the hoverboard charged. Put the hoverboard in front of you, with the LED lights facing forward. If your unit has different modes to choose from, place it in Beginner/Entry mode. With your dominant foot, put one foot on the hoverboard. 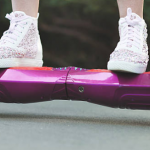 With said foot, set the hoverboard into an upright and level-riding position. Once you are ready, place the other foot onto the other stepping place. Think of it just like walking up the stairs. Hoverboards are designed to balance you, so do not overthink. If you are still worried, you can start doing it beside a wall, so you can have something to hold on to. Note: Make sure your feet are widely-stanced. Keeping you feet in narrow distance would make you lose stability with the hoverboard. Now that you’ve balanced yourself in it, next step is moving with it. There’s alearning curve to moving your hoverboard, despite it considered easy. Simple instruction: move backward and forward by shifting or leaning your weight. You might wobble at first try, but that’s normal. One can get a hang of it through practice. 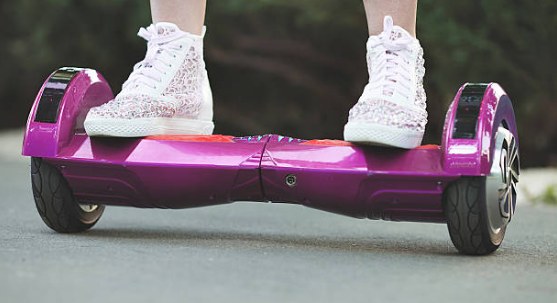 Each side of a hoverboard is considered independent. So, you have the ability to twist each side. To turn right, push your left foot forward. To turn left, push your right foot forward. That indpendent foot pressure provides the twisting motion that actuatlly turns the board to the direction you aim it. Despite sounding so easy, it is recommended to start with slow and controlled turns before trying out quick spins. Several hoverboards for sale with different claims are in the market now. Figuring out what to choose among them can be tricky for some. But first and most important factor to consider is safety. One must find a brand with UL certification. 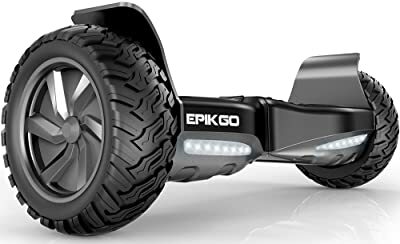 Among the brands we have reviewed above, the one which stood out from the list is the EPIKGO Self Balancing Hoverboard. Besides having the certifications needed for safety purposes, I appreciate the motors were placed in the wheels than in the board. This means one could easily balance on this self-maneuvered scooter. This might also be a great choice for people who live in a community with few smooth terrains. It is said to easily plow through different terrains, even in water. Now that you might already have chosen the one for you…. Do not forget to get yourself safety pads and helmet too. One can never be too careful.